Whilst we’re spoilt for choice in Sydney in terms of things to see and do, many of them come with a hefty price tag- especially for families! Here are some free and cheap things for you and your children to do when your budget is running low. At ellaslist, we love all things playgrounds- new playgrounds, playgrounds right near cafes, indoor playgrounds in shopping centres, fenced playgrounds….you name it. Playgrounds are a good old fashioned way to get the kids working off some of that energy, breathe in the fresh air….and seriously save some dollars. 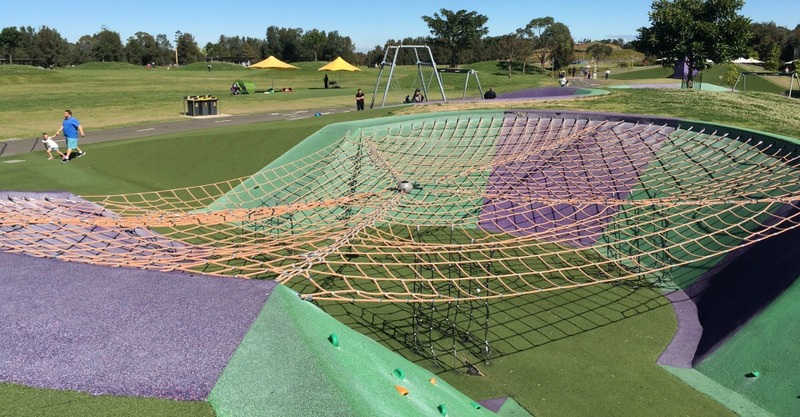 If you’re looking for a new playground to try, why not the new Blaxland Riverside Park and Playground? It sure does have the WOW factor with a water play area, HUGE open spaces, climbing nets, rope courses and an awesome double flying fox. For a great playground near you, check out our wrap up of our all time fave playgrounds in Sydney. If it’s a hot day, then here are cheap and free things for families in Sydney that are sure to keep you cool. We just adore water play parks- did you know there are FREE ones in Sydney including at Darling Quarter, Blaxland Riverside Playground and Putney Park?! Indoor pools usually charge entry fees, so why not take your kids to an amazing rock pool? Try to spot a mermaid lurking in the Bronte Bogey Hole or spot a crab scuttling around the rock pool at Freshwater. Take this opportunity to allow your children to explore the natural world. Priceless. If you fancy a drive, pile the kids into the car and go check out one of these wonders- waterfalls just out of Sydney that will take your breath away. From trickles to cascades, bask in these beautiful flowing waterfalls- destinations well worth the journey. If you just fancy plodding along in your car, having a screen-free day and seeing some new sights and exploring, we’ve got you covered with road trip guides to Palm Beach, Kangaroo Valley, Upper Blue Mountains and Minnamurra Rainforest. A beautiful day or evening calls for a family picnic! Some of our favourite picnic spots here at ellaslist include Centennial Park and the Royal Botanic Gardens. The best part? You can bring all of your favourite snacks, and some balls and games for the children to run and play with. Hours of enjoyment and family bonding are made easy with our guide on how to make the perfect picnic for kids, and our top lists of Sydney picnic spots and our top picks for families. While some galleries and exhibitions require tickets that can sometimes cost an arm and a leg, did you know that there are heaps of great galleries and museums you can go see for free? The Australian National Maritime Museum’s “Free Galleries” ticket allows adults & children to view the permanent galleries for free, and the same goes for the Museum of Contemporary Art. Gaze into the beyond with free entry during day visits (10am-5pm) at Sydney Observatory, or learn about some Aussie history at The Rocks Discovery Museum and take advantage of their free admission policy. At Sydney Living Museums you can enjoy 12 different museums, and children under 5 are free. Or if you become a member you all get free entry to all of the museums and historic houses, plus discounts, offers and more. Find out about membership here. Whether it's snagging a bargain or just browsing through the trash and treasure, have a family day at the markets- we are so lucky to have many of them in Sydney. Whether it’s Bondi on a Sunday, Glebe, Paddy’s Markets or Paddington (just to name a few), there’s something so wholesome and spirited about getting down to your local market day. If you’re hungry, check out a farmers’ market which can get you a fresh and nutritious meal for usually a heck of a lot cheaper than a cafe or restaurant. We love the Saturday ones at Bondi Public School and Randwick Public School (which even has a jumping castle and pony rides)! Eating Out: If you still want the service and experience of dining out but are on a budget, here are some awesome family-friendly restaurants and cafes where kids eat free- so your bill will be a little more easy to swallow! Have A Cooking Day: Cooking with kids doesn’t have to be a messy, expensive nightmare! There’s a 2-ingredient chocolate cake you can make with ingredients you probably already have in your fridge, and a brownie pop recipe that only requires 1 bowl to work some delicious (and cheap) magic. One For Mums: Are you a mum that needs a little bit of R & R? Have a relaxation or remedial massage at the Australasian College Of Natural Therapies student clinic: Appointments are super cheap and supervised by fully qualified professionals, so you’re in good hands. Coastal Walk: A Sydney past time- get kids involved with a bit of whale watching as you make your way from beach to beach. Treating them to an ice cream at one destination won’t break the bank. We love the stunning new coastal walk at Malabar (see hero image), and check out our review here. Wander Around The Grounds: The Grounds Of Alexandria is a beautiful place for families to wander- check out Harry Trotter, the new resident pig and his farmyard pals, fresh flowers, cool industrial design…and maybe even a very special treat like a homemade lemonade or a cronut. Stay In A Shipping Container!